Betty Blizzard 81, of Milledgeville passed away on Friday, November 30, 2018. 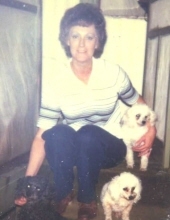 She was born in Milledgeville on April 29, 1937 to the late Samuel Bryant Blizzard and Gladys Babb Blizzard. Betty was preceded in death by her brothers Roger, Arthur and Levi Blizzard. Betty enjoyed gardening, and helped to raise her nieces and nephews, but especially loved to spend time with all her family. The visitation will be on Sunday, December 2, 2018 at Vining Ivy Hill Chapel at 2 pm followed by a service at 3 pm. To send flowers or a remembrance gift to the family of Betty Blizzard, please visit our Tribute Store. "Email Address" would like to share the life celebration of Betty Blizzard. Click on the "link" to go to share a favorite memory or leave a condolence message for the family.